IMPORTANT: this bug has enough information; please don't post _anything_ unless a developer asks for specific feedback! By posting to this bug you only make it harder for a developer to spot the gem comments. Please use the "me too feature" of launchpad to signal that you are affected and would like to see this fixed. Should the timing of the mounting and dismounting be changed so that it works? It is related to the starting of network-manager and CIFS shares trying to connect on startup *before* the network is up, and dismounting the shares *after* network-manager is stopped. Is there anything in the logs about your connection? how do i get the shutting down logs so I can show you the errors there? Do you get the same error when you mount the share using the command line? I can umount and re- mount the shares using the command line (sudo umount -a and sudo mount -a) and it works successfully. I get nautilus sessions opening for each mounted drive every time I do this, which is very annoying! I *really* think that the problem is to do with the system attempting to read the /etc/fstab file and mount the drives *before* the network is up, and the reverse on the dismounts at shutdown/restart. This works OK, as I get the drives mounted and then a separate nautilus session opens for each connected drive (which as I said previously is very annoying! ), but we have the errors in the logs to prove that not all is good with this system of mounting drives. As you can see, S40umountfs is *after* S15wpa-ifupdown in both the above rc0.d and rc6.d. I *strongly* believe this is the problem. The last part of this is a wpasupplicant bug. The ordering of the shutdown scripts is already well-established, and unmounting remote filesystems takes place at S31 (S31umountnfs.sh). wpasupplicant needs to be fixed to run its shutdown script later than this; probably at S35 or S36, which is the point in the runlevel sequence where networking as a whole is shut down in Debian. I have changed wpa-ifupdown to S41 for both rc0.d and rc6.d, but I still get the problem. Is there something else that needs to be changed? I am commenting here to keep this thread alive, and wondering if any of the wpasupplicant team are looking at it? More than happy to keep experimenting and chatting about it! Thanks. I don't know if this bug is related to #212019, but the unmounting problem exists for me on a machine with no wifi-capabilities. I'm about to try http://ubuntuforums.org/showthread.php?t=293513 as a fix tonight, but that sounds like a workaround rather than a solutioni. This bug occurred for me on 7.04. Yesterday I upgraded to 8.04 through 7.10, and the problem still exists. Haven't yet tried the workaround I mentioned, but I'm fairly sure it will work, since manual unmounting fixes/works around it. FYI, my reports are just for logging off, haven't seen any problems during startup. I wonder why this bug is not fixed yet! It has been proposed to change S31umountnfs.sh to K14umountnfs.sh in /etc/rc0.d and /etc/rc6.d. For me that works fine, but I am not shure that it can't create inconveniences in other cases. Please have a look at this simple workaround whether it can be recommended. I believe there are also duplicate bugs. I agree with flaccid: This perpetuating and ennoying bug should be fixed as soon as possible! That has even become more important with Hardy, since "smbfs" does not exist as a workaround any more, "smbmount" being nothing more than a wrapper for "mount.cifs". The simple solution proposed in the link quoted by flaccid is the same as what I mentionned above, changing the shutdown-sequence. Would please an expert have a look at this to make sure it cannot cause other troubles! # Short-Description: Unmount all network filesystems except the root file system. # usbfs, sysfs) that are not mounted at the top level. I think the reason that moving S31umountnfs.sh to K14umountnfs.sh addresses the problem because there is now a dhcdbd script at K16dhcdbd which takes DHCP connections down much earlier than it should. So I believe that in addition to the wpasupplicant bug, we have a bug in dhcdbd; both of these run stop scripts at a much earlier point in the shutdown than S31umountnfs.sh, and should be moved to S35 or S36 for consistency with existing behavior. There is also definitely still a bug in samba, which should not take so long to time out on an unmount request when it's detectable that the network is down; but the init script bugs are rather easier to fix, and are bugs in their own right. I don't think I have the problem on login, but I certainly do on shutdown - i.e. everything freezes with 3 bars left on the Ubuntu splash, then my whole screen goes white, and I have to force shutdown my laptop, (by holding down the power key for >5 secs) every single time. Just migrated up to Intrepid, and the problem's still here. Testing out Intrepid on my laptop here. I get this annoying pause every time I shutdown. And the share works fine. But shutting down is painful. Again, this is Kubuntu Intrepid from a recent install of Alpha 5 cd. All updates applied as of this post. Anything I can do to help resolve this, I'm no expert but I'm willing to do what I can to help. This annoying bug is known for a very long time now. I wonder why nothing has been done yet! Another 'me to' running on Intrepid. Been a problem since at least hardy. Fix doesn't seem hard (Just a change in the unmount order). Possibly its also a upstart bug since its the init system? I am experiencing this too with Intrepid. I use wireless connections from a laptop. Network Manager is dropping the network before the CIFS shares are unmounted causing multiple timeouts trying to unmount the during the shutdown process. I'm not sure dhcdbd is affected because stopping it doesn't seem to bring down DHCP connections (at least not immediately). So the solution to this bug could be to move S15wpa-ifupdown to S36wpa-ifupdown in wpasupplicant. Maybe this helps (or complicates things). I have a wired pc, desktop, no wireless at all.... same issue. Oh, and that one is on Hardy. I tested the commands, Thierry, and there was no difference. I didn't really hold out a lot of hope, though, because I don't run the WPA supplicant. 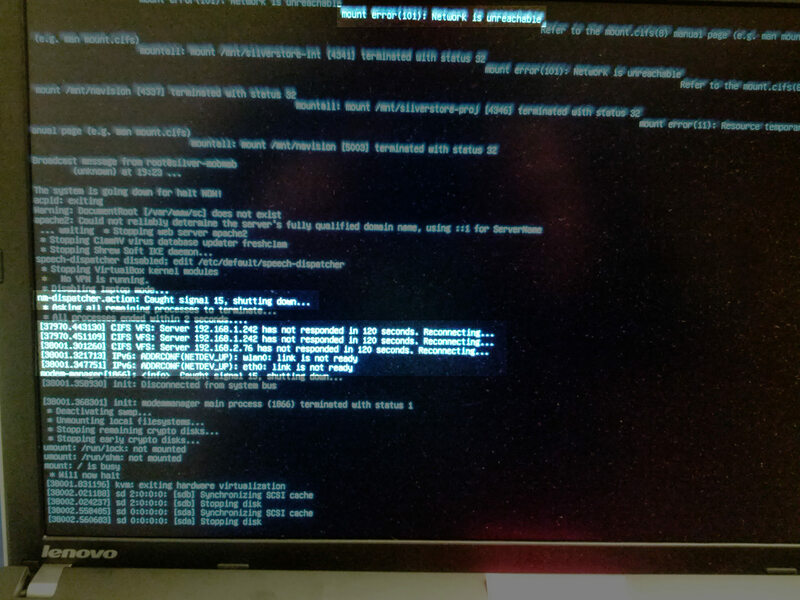 Everything works perfectly when I umount the CIFS filesystems before shutting down. I also found that Suspend and Hibernate modes work better too (as an aside). Strange, umountnfs.sh (I double checked it for cifs) runs before networking so of course one would have to think everything would be okay. Does the logging off of the Gnome session, ending the Network Manager in the notification area, have something to do with it? I wonder what would happen if the networking was all static startup/shudown entries and network manager was never run (or even uninstalled). Hm, so that might be related to user-level network configurations from NetworkManager being brought down at session logout (typically the NM wireless connection falls in that category). It seems obvious this might not play well with network services (client or server) that expect network to be up very early (and very late). And that would not be as easy to fix as some think it is... as the "fix" would surely affect a feature that most people like. confirming that "$ sudo mv /etc/rc6.d/S15wpa-ifupdown /etc/rc6.d/S36wpa-ifupdown" doesn't fix it. Do people who were experiencing this bug with a wired connexion still have this issue in Intrepid fully up to date ? I had this issue on my desktop computer but it seems fixed now ? still has the bug on fully updated intrepid (as at 29-Oct night); wired connection. Yes, the whole network shutdown sequence needs to be revisited so as to work properly in the most common cases. See also bug 41794 for a related issue: Network filesystems being unmounted after the VPN is closed. Everything now works perfectly as far as I have been able to tell. No delay in shutting down and the Suspend function seems to be working properly as well -- sorry I haven't tested Hibernate because I never really use that anyway. I mention the Suspend function because in the past with NM and cifs in the /etc/fstab file Suspend used to only work the first time, then every time after that the network would not reactivate and I had to reboot. Just in case anyone else is interested in that little tidbit of information. This seems to definitely be a Network Manager induced condition. Fully up to date Intrepid +1. I would really like to see this bug get fixed, the response time on this on makes me feel like I am on Windows again. Yeah I would have to say that response with things in Ubuntu is pathetic. A lot of the time its hard to get something fixed for the next release let alone in the current release where it should be fixed. Its the good old 'have to upgrade to the next release to fix this problem, and then i get fresh new problems in the next release' (or continue to wait for a bug to be fixed and then it gets expired!). Considering the people copied on bugs like this, its like they don't read their email.. So will somebody with authority like in Canonical get off their behind and sponsor one of the fixes that has been available for a very long time. are there any up/down scripts for samba hooked into etc/network/if-up.d/ and /etc/network/if-down.d/ ? If not, we should try that as NM calls those scripts after network is up or before its downed. I would like to submit this for review. How would I "attach a fix to this bug" which involves only renaming files? Can you do it? If you actually spent some time reading the bug and its related duplicates etc. you wouldn't need to ask that question. The Upstart file I posted on #153 +autofs5 installed(very important) solves it for me on 10.10. over wifi. Autofs has to be installed, or the bug will stay. Today i found this is the working combo for me. You might want to try this with Natty, i was planning in the next few days, too tired today. I have two machines running 11.04 with a wireless connection. I was able to get a clean shutdown on both by changing the link to /etc/init.d/umountnfs.sh in /etc/rc0.d and /etc/rc6.d from S31umountnfs.sh to K15umountnfs.sh. This is a workaround, not a fix, as it simply starts the cifs/nfs file unmounting script earlier in the shutdown process. I got a desperate workaround, it's in this link: (http://hardc0l2e.wordpress.com/2011/06/30/ubuntu-11-04-shutdown-and-restart-problem-with-cifs/). It works, but not the best way to deal with this bug. After months of attempts to fix this, I've finally found one that works for Kubuntu 11.04 (Natty). The problem is that Kubuntu (and I believe KDE more generally) starts the shutdown process in a way different than Gnome/Ubuntu, so even the dbus / netbase fixes, the fix above in #158, and using autofs all didn't work. I think KDE begins shutting down userspace functions like network manager first before the /etc/init scripts or /home/user/.kde/shutdown scripts are called upon. Just speculation on my part, but that'd be my guess. But I apparently found the place where Kubuntu actually starts the shutdown process, or close to it - it's in the /usr/bin/starkde script. Immediately after the line saying "echo 'startkde: Shutting down...' 1>&2", I inserted a line saying "sudo umount -t cifs -a -f -l". Then, using visudo as root ("sudo visudo"), I edited the sudoers file to allow the sudo command to execute umount without a password by adding the line (at the bottom of the file) "username ALL=(root) NOPASSWD:/bin/umount". Worked like a charm. It works for me and few tested notebooks and desktop PC. @c0l2e : Wow, thanks man! I can confirm that your fix works great on all all systems as well (lucid). @c0l2e: could you please provide a step-by-step explanation about how to make your solution work? Where should I put that text? Put it in /etc/init/dbus.conf. You'll probably find an existing pre-start/end script section in it (I did in mine). Just paste all the lines (including the pre-stop and end script lines) into that file, after the existing end script, or before the line that starts "exec" if you don't have a pre-start section in yours. I found that it didn't work the first time I rebooted (maybe the script is read and cached somewhere before I changed it), but the next time I rebooted, it worked. Rename the current shutdown, reboot and restart commands in /sbin. 3. Make similar script for reboot and restart command which also points to /sbin/reboot2 and /sbin/restart2. Could this be related to cifs getting mounted twice (when present in fstab)? It took me quiet some time, to test, and find a solution. So the ro mount are mounted twide..? While the rw get mounted once..
the script in dbus.conf. Does anyone has a solution for this? > duplicate bug report (768506). > the script in dbus.conf. Does anyone has a solution for this? seems the only option without many surprises. > On Mon, Oct 24, 2011 at 16:03, Gonzals, S.
> > duplicate bug report (768506). Is the solution described in comment #143 and comment #147 really the correct one? In short, that means dbus always stops on the event deconfiguring-networking, which is emitted when "/etc/init.d/networking stop" is called. In other words, whenever "/etc/init.d/networking stop" is called, dbus gets killed. That has a nasty effect: when dbus stops, gnome-settings-daemon crashes and that means the desktop theme is lost. Please see bug #868095  and my comment #3 on that bug. VMware Tools does this all the time (calling networking stop) when suspending the machine. That means you are guaranteed to get a horrible looking (and not completely functional) desktop whenever you resume your VMware session. In conclusion, this seems to be a serious issue. I wonder if that is happening with more people besides myself and the other fella on bug #868095. > gnome-settings-daemon crashes and that means the desktop theme is lost. Yep, that's one of the side effects of this particular workaround. the changes in /etc/init/dbus.conf still in effect. shuts again. This possinly indicates it has to do with certain boot options? Come on, a fix can't be done for this 4 years on? With all the various workarounds people have put in above comments, surely one of them can work for everyone?! > Come on, a fix can't be done for this 4 years on? In fact, between dbus and network-manager now waiting for the 'deconfiguring-networking' event before shutting down, and NM registering its child processes with /run/sendsigs.omit.d to fix bug #869635, I believe this should resolve the problem for the NM case in 12.04. Please test with the 12.04 beta and see if this isn't resolved for you. > surely one of them can work for everyone?! Nope. All of those workarounds are specific to one configuration or another. wpasupplicant no longer includes an init script at all, so this task can also be considered fixed. Steve Langasek - I have just tried to replicate in 12.04 beta and could not reproduce the issue any more. I had a mounted a SMB share using /etc/fstab which appeared to be successfully unmounted prior to shutdown (or at least, it didn't hang for a minute or so, it shut down immediately). What type of VPN connection? If it is managed by NetworkManager, it should be brought down when network manager is brought down, *after* all network filesystems are brought down. If not, that seems like a bug in whatever is running VPNs, but its probably not *this* bug. I would suggest reporting it separately with 'ubuntu-bug xxxx' where xxxx is the package which controls your VPN. Well, that would normally be correct, but the VPN plugins depend on vpnc, pptp, openvpn, etc. to be running to establish and keep the VPN connection up for rekeying and such. Those don't get a pid file in /run/sendsigs.omit.d yet, and so they would get killed by the sendsigs script shortly before upstart jobs actually stop network-manager, and possibly before the remote storage is unmounted, depending on when that happens. Network storage is always unmounted after sendsigs, by design. related to the symptom of slow unmounts on shutdown. > network filesystems are brought down. > 'ubuntu-bug xxxx' where xxxx is the package which controls your VPN. I'll open a bug myself shortly for the VPN case; and reply here with the bug number. The problem is still there on a fresh Raring installation. Here's a screenshot of the last few lines visible before my notebook shuts down. It's 13.04 as of May 27th. This indicates that some part of NM is not being correctly guarded from /etc/init.d/sendsigs, resulting in abnormal termination that breaks the network connection before network filesystems are being unmounted. Network Manager has previously been fixed for such bugs, but it seems to have recurred. Please file a new bug report against the network-manager package including the screenshot and this information, and paste the number of the new bug here. Regarding the CIFS mounts: Today, I changed the "auto" cifs mounts during startup to "noauto,user" mounts, which get mounted by my user using a script after login. At the end of the day, the delay upon shutdown was gone. a result, this bug against natty is being marked "Won't Fix". It's a slightly different problem, I guess, but in Kubuntu 13.10 the shutdown does not complete for me. It stops with the message "Stale NFS file handle". I suppose this is a different bug because it involves NFS, not CIFS. Unfortunately, the bug seems to be back in Ubuntu 16.04 (Xenial) now, probably due to changements in the boot and shutdown sequences. See also [bug 1577885]. Displaying first 40 and last 40 comments. View all 195 comments or add a comment.